The weather forecast for the first day of 2019 was predicted to start around 50 degrees and maybe even get up to 60 by midday. 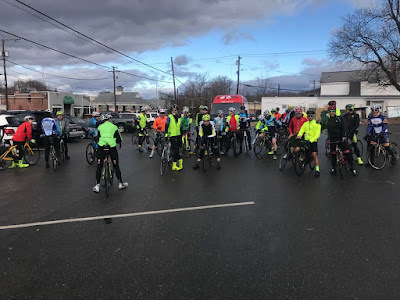 I was invited to the Bethel Cyclery (former) shop ride that was jumping off from the Broken Symmetry Brewery at 10 AM. It's also the former site of Bethel Cyclery. Heading out from my house at 9 AM I found that the roads were really we wet from last night's rain so I turned around and headed back to get a fender. This set me back 15 minutes but I new it was a 40 minute ride from my house to Broken Symmetry. I got to the brewery with 5 minutes to spare. I met up with Stephen, Shin, and few others that I have me over the years that I have been road riding, even one guy that worked with at GE Capital. I thought Gavin and Mike were going to be there but they were no shows. All these guys here were really fast riders and I realized that this was the type of ride where I am going to get dropped. I thought there were was a B group but learned later that they left at a different time. I figured I would just do my best to keep up and see what happens. 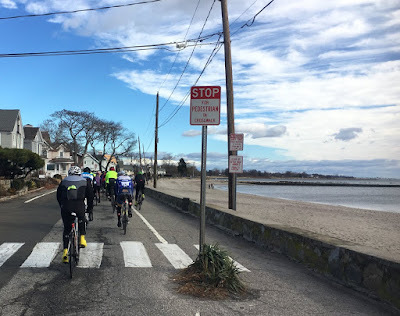 We all headed out and made our way over to Route 53 and headed south towards Westport. There were some really fast riders in this group all sporting some really fancy bikes. (b) Persons riding bicycles or electric bicycles upon a roadway shall not ride more than two abreast except on paths or parts of roadways set aside for the exclusive use of bicycles or electric bicycles. Persons riding two abreast, as provided in this subsection, shall not impede the normal and reasonable movement of traffic, and, on a laned roadway, shall ride within a single lane. I guess the bit about shall not impede the normal and reasonable movement of traffic is open to interpretation and it appears the police have their own. By the time we got into the Fred Zone and the first climb I found myself off the back and knew by the first climb I would get dropped. No worries, perhaps I could catch up to them at some point. There were even a few stragglers back there with me. I was trying to get one to stay with me but he faded at the Weston Market. I wasn't worried about where to go because this route is part of my bike commute. By the time I got through Westport, I caught up with the group waiting at the light to cross the Post Road. Crossing over Greens Farm Road and heading back onto 136 under I-95, Stephen went down on the deck. He was in the shoulder trying to get onto concrete portion of the road and his front tire slipped out from under him due to the uneven transition and the fact that both surfaces were wet and slick. Fortunately, he was going slow enough that it wasn't a bad crash but it was still a crash. He had some road rash, and his shoulder and hip hurt but all in all he was good to go. The group popped into Long Shore to use the facilities, have a snack, and take a few more pictures. The sun was out and it was starting to warm up. From here we headed to Compo and then back out to Greens Farms. I was hanging but always off the back. Heading back to Bethel I ended up riding with a smaller group that hung back with Stephen but Shin was having a rough go as well through Fairfield. Ironically, towards the afternoon, the wind came up and it actually started to cool off. We split off onto Hopewell and then took Boggs Hill. We said our good byes and Stephen and Shin headed down Platts Hill. Shin went on to ride 100 miles that day. I probably could have done more but I was looking forward to a nice cold 24oz PBR Tall Boy I had in the fridge.